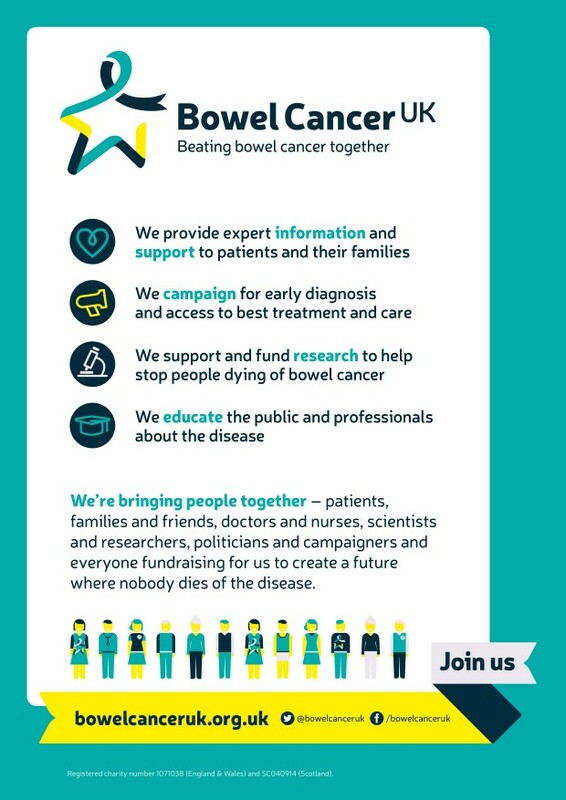 We provide expert information and support for everyone affected by bowel cancer. Our online forum is a place for people to talk about their experiences, share their knowledge and support each other. Our website has lots of high quality information about bowel cancer and we publish a range of helpful booklets. We campaign for early diagnosis and access to best treatment and care. We’re leading change for younger bowel cancer patients, campaigning to improve survival and quality of life for those with advanced bowel cancer and working to improve early diagnosis by ensuring people are getting the right test at the right time. prevention, early detection and treatment of the disease. We run training, workshops and study days for healthcare professionals. We also have a dedicated team of volunteers who give free awareness talks to workplaces and community groups across the UK, spreading the word about symptoms, risk factors and bowel cancer screening.